Almost everyone has heard of interest. If you have a bank account, the bank probably pays you interest. (Even if it is a 0.000001% interest rate) If you have any debt, then you are likely paying interest on that debt. However, do you understand the effects of compound interest? Compound interest is the effect of earning interest income on the interest that you’ve earned before, or paying interest expense on the interest portion of a debt that you owe. What does that mean though? In this post, we’ll walk through two examples of compound interest. The first example will be of a magic doubling penny, and the second example will be more realistic as we look at compound interest in an IRA. There is an old story about a magic doubling penny in which someone is asked to make a choice. I’ll illustrate this for you. Pretend that you have the choice and think about the results. Which choice is going to make you richer? The $1,000,000 choice is clear. You have a $1,000,000 and are an overnight millionaire. Nothing else to worry about. So now if you chose the penny you’ve made it to the end of a week and still have less than $1.00, while those who chose the $1,000,000 have gotten to be millionaires this whole time. This would not have been a very fun week for you. Let’s step forward to day 10, and you have $5.12. So, after 10 whole days, one-third of your month, you’ve only just gained the ability to buy a cup of coffee, while the millionaire has been able to live in style this whole time. Imagine, if you were impatient at this point, and decided to spend your money and buy a cup of coffee. Now you’d have to start back over again, and would never see the future gains of compound growth working for you. Let’s jump forward again to day 21, a whole three weeks out of your month. Your penny is now worth $10,485.76. That’s not too bad. You can now buy a cheap used car with your money. However, you are only barely 1% of the value of of the millionaire after a full 3 weeks. Imagine you didn’t stop and buy a cup of coffee after ten days, but now you decide to buy that car. That’s not bad for three weeks of holding on to a penny. However, you’re still way worse off than the millionaire. These stopping points are critical to think about. Most people never let compounding continue long enough to see it’s full effect. In the first ten days you made $5.12, while in the next 11 days you made over $10,000. That is not linear growth by any means. However, it is the last ten days of growth in this example which make all the difference. As you can see from the table, it was in the fourth week of the month, where your gains start to skyrocket in value. However, it isn’t until the 28th day of the month that you finally pass the million dollar mark. This is the first point where the penny becomes the right decision. The penny then proceeds to gain in value to over $10 million by the end of the month on the 31st day. 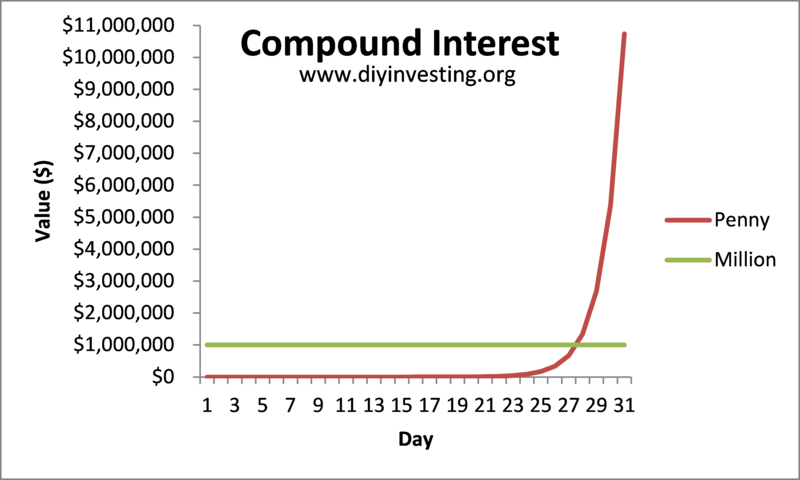 Compound interest can be very powerful. Just normal “interest” on the penny even at the 100% interest rate used in the example is just $0.01. If your interest didn’t compound, then every day you’d still receive a 100% return on the original investment of $0.01. However, you would only have $0.31 by the end of the month. Luckily, your interest was able to compound on itself. That 100% return (doubling) was in effect on not just the original penny, but also all of the gains made by doubling the penny. This is the heart of compound interest. There is an urban legend that Albert Einstein called compound interest the greatest force in the world. While there is no factual basis for this statement being attributed to Einstein, it does hold some truth to it. The exponential effect that compound interest can have in your favor, if you’re being paid interest is huge. The same compound interest effect can also make it nearly impossible to get ahead when you’re in debt. If you’re paying interest upon interest, you have this great force working against you and only growing your debt further. This is most common with credit card debt, and is why I believe credit card debt to be completely toxic. Compound interest demonstrated with the value of a penny that doubles every day for a month. This graph is VERY important for you to remember when you think about investing. The scaling of the chart is based upon million dollar increments intentionally. Many people think about saving up $1 million for retirement or some similar goal. Or they just wish to be millionaires someday. That number can be incredibly high and hard to envision achieving for the average investor. The reason is that just like the penny above, for many years (or days in penny example) it seems like you are making no progress towards your goal. In addition, most people will choose to stop compounding before they can see the really large gains. This could be because they value that cup of coffee, or car more than the money, or that they simply don’t understand how important the time factor is to compound interest. On the graph, the penny essentially looks flat-lined for the first 23 of 31 days. That’s because compound interest growth like all exponential growth, seems to go nowhere in the very beginning. It is hard to look at investment account statements and see that your thousands of dollars in investments gave you only a few dollars in dividends. This also applies to bank statements where you might only see pennies earned in interest. It is important to remember that this will be a common occurrence with investing. Don’t let it worry you in any way. Just remember that it is the precursor to the massive surge in investment gains that come with your investment gains compounding over time. Patience is everything. The previous example is great for demonstrating how exponential growth works in the form of compound interest. However, it lacks any basis in reality when it comes to the rates of return illustrated and the whole “magic” element. I’d like to present to you a more realistic example of compound interest to which all Americans can relate. This example will center on a generic IRA tax sheltered investment account. It can be a Traditional IRA or Roth IRA. It doesn’t really matter for the purposes of this example. 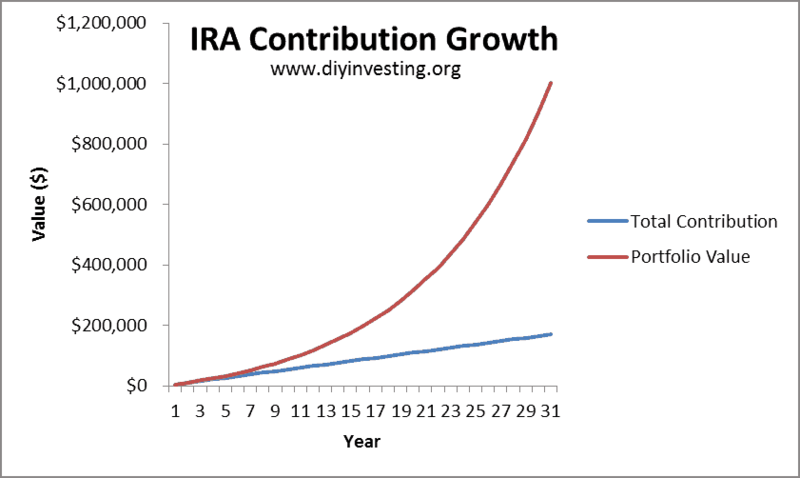 The maximum annual contribution limit for 2015 is $5,500 for an IRA. This is increased by $1,000 if you are over 50, but for the purposes of this example we’re only going to use $5,500 annual contributions. You can learn more about IRA contribution limits on the IRS government website. Let us assume that someone is 24 years old when they begin investing and they decide that the ONLY thing that they’ll do for their investments over their lifetime is max out their IRA contributions. We can use the following chart to show the growth of their investment portfolio. I am using a 31 year investing time horizon which will take our hypothetical 24 year old to 55 years of age. I decided to use 31 years to imitate the 31 days shown in the prior penny example so that you have something to compare the results against. As you can see by this example, our investor could expect to become a millionaire at the age of 55. This is accomplished simply by maxing out his or her IRA contributions every year. Granted, their million dollars will not have the same purchasing power as it has today, because inflation would have reduced the value of their gains somewhat. However, they still would have achieved the million dollar mark. I think it is important to consider how the Portfolio Value line steadily diverges from the Total Contribution line. This means that over time, the gains of your portfolio become less contingent on the contributions for continued growth. This is compound interest at work. At the beginning, the growth of your portfolio is mainly driven by how much money you contribute. This is shown by the lines staying close together. However, in the later years, the growth is pretty much independent of the relatively small contributions. It is this effect of compound interest which you want to harness in your investment portfolio. You can set yourself up for long-term success by following the information and guides on my blog, while taking advantage of the resources that I recommend for you. Over time, I expect to develop this blog into your one-stop shop for making sure that you’re on track for success in your investments. What are your thoughts on compound interest? Is there something you can add to the discussion or something that I missed? Please take the time to comment below, and we’ll all benefit. *Note: My personal outlook going forward, is that the stock and bond markets will return lower than the historic 10% and likely something closer to 6-8% nominal returns over the next decades based upon current stock price values and the global economic outlook. This assumes no dramatic change (either positive or negative) in economic growth due to technology, war, or other reasons.